May 22, 2017, 9:24 AM · In an effort to promote the coverage of live violin performance, Violinist.com each week presents links to reviews of notable concerts and recitals around the world. Kyung Wha Chung performed the complete Bach Sonatas and Partitas for solo violin at Carnegie Hall. New York Classical Review: "For all its technical shortcomings, this recital made clear that Chung still has something worth sharing with audiences." 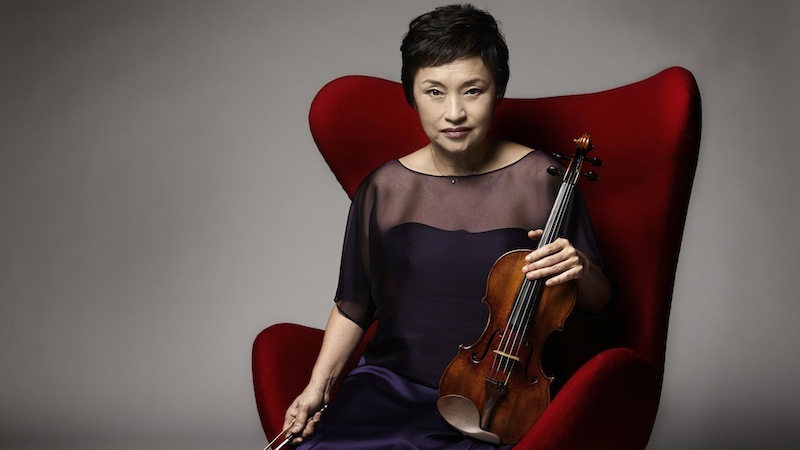 New York Times: "You could appreciate her bravery in a marathon presentation of all six of Bach’s sonatas and partitas for unaccompanied violin at Carnegie Hall, but not entirely ignore the obvious difficulties involved." ZEALnyc: "No one who was there will ever forget it — or should: this was a performance for the ages...Bach lived in one of the great dance-cultures of all time, and Chung never quite forgets the dancing feet behind all the heart-stopping melodies and the drop-dead counterpoint." Leonidas Kavakos performed the Brahms with the New York Philharmonic. The New York Times: "...a diffident, sometimes messy reading of Brahms’s Violin Concerto....Mr. Kavakos seemed most at ease in the first movement’s searching, experimental cadenza, where his playing felt elegant and personal." Gil Shaham performed Prokofiev's Violin Concerto No. 2 with the with the Houston Symphony. Texas Classical Review: "His performance was virtually flawless, with a prodigious technique and silky tone throughout. He made the most difficult passages sound easy, and his free use of the bow rarely produced a compressed tone." Satu Vanska performed Locatelli's The Harmonic Labyrinth with the Australian Chamber Orchestra. Daily Telegraph: "Vanska’s wonderful performance brought the whole audience to its feet." The Sydney Morning Herald: "It is nicknamed The Harmonic Labyrinth, though the harmonic language was rather static while Vanska turned triple somersaults backwards on the violin to meet its outrageous demands." Stephen Waarts performed Prokofiev's Violin Concerto No. 2 with the Orchestra of St. Luke's. The New York Times: "In the first movement, which begins with a melancholic solo theme for violin, Mr. Waarts tapped into tensions within the Neo-Classical veneer of Prokofiev’s music. He played that melody with warm, soothing sound, but also a hint of anxiety." Frank Peter Zimmermann performed the Beethoven with the Singapore Symphony Orchestra. The Straits Times: "Beethoven's Violin Concerto...is a work that seems to weather repeated outings, especially in the hands of a musical giant such as Zimmermann." Veronika Eberle also performed the Schumann with the San Francisco Symphony. The San Francisco Chronicle: "An alert soloist can, and in fact must, make a powerful case for (the Schumann concerto). Eberle, unfortunately, did not. This is not to deny the splendors of Eberle’s technical gifts. She boasts a beautiful string tone, at once warm in demeanor and dark in coloration, and she can dispatch demanding passagework accurately and with winning ease. I look forward to hearing her again in a more traditional showpiece by Mendelssohn, Sibelius or Tchaikovsky."